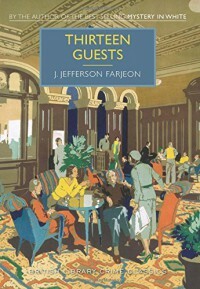 Thirteen Guests, A British Library Crime Classic by J. Farjeon is a mesmerizing Country House murder with multiple suspects, murky motives & flowerly language. I gave it four stars. "She placed the tray on a sideboard, covered the stained table with a scarcely less stained cloth, & moved the tray to the table. The seed cake presided with dejected majesty on a tall, glass-pedestaled dish. Its mission appeared to be to make thick slices of bread & butter appealing by comparison." I received a complimentary e-copy from Poisoned Pen Press & NetGalley. That did not change my opinion for this review.